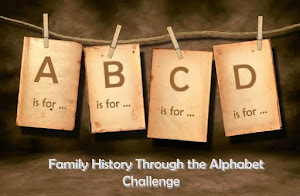 Here we are, the last post (bugle sounds) for the Alphabet Blog Challenge and once again I have to credit somebody else for the topic of the most baffling letter of all. My amazingly perceptive daughter came up with Zeppelin. 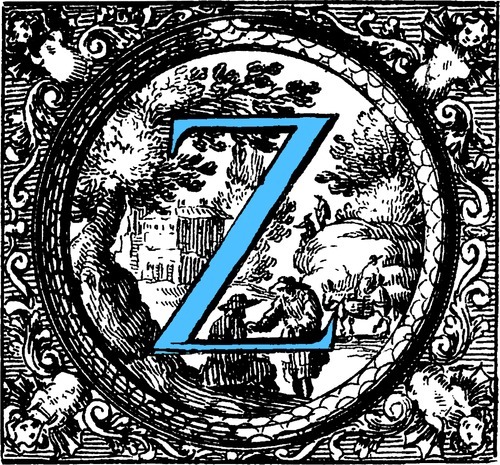 How could I refuse when I've already blogged about my 4xgreat-grandfather Zachariah Rudd? It makes perfect sense to write about the Zeppelin raids which affected my ancestors, not least because my ancestors lived in London and along the East Coast of England (the counties of Suffolk, Norfolk, Essex and Kent were repeatedly raided from 1915-17) but because my paternal grandmother Freda often spoke of her parents who saw the Zeppelins as they came across the North Sea. Before the First World War, Count Ferdinand von Zeppelin developed an airship specifically for long-distance passenger flights. When the war broke out in August 1914, these airships were taken over by the German army. Throughout the war the Germans were prepared to try new forms of warfare and in January 1915 they mounted the first airship raid on England. On the night of 19 January, two Zeppelins bombed the docks at King's Lynn and Great Yarmouth (county Norfolk) which killed four people. The East Suffolk Gazette reported that a Mr T W Holmes of Denmark Road, Beccles "believes he heard an airship coming over the town, possibly on its way back after its tour in Norfolk". 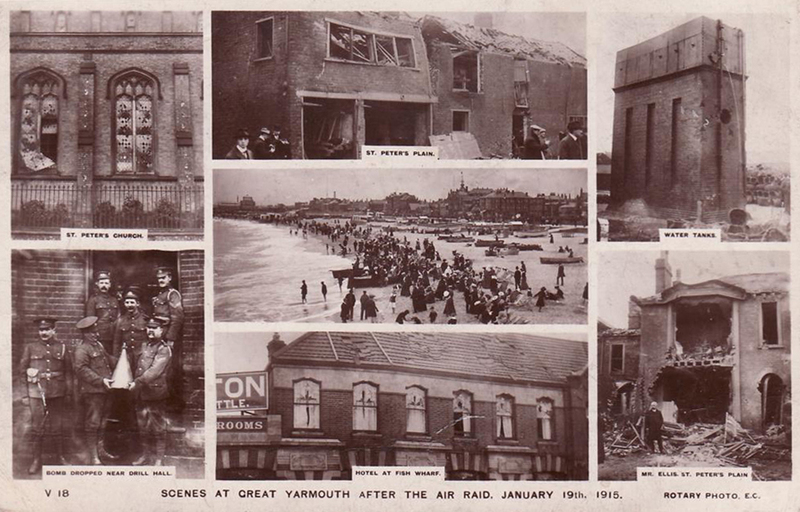 Other raids followed and much damage was inflicted across the Eastern Counties. In the Autumn of 1915 a raid on the City of London killed 38 people and caused extensive damage. During my research into the Zeppelin raids I was amazed to discover how they were made. Zeppelin airships had a metal frame containing large bags of hydrogen gas, which lifted the craft into the air. They were powered by engines mounted outside the craft. Crew and bombs were carried in a gondola which hung underneath the craft. There was no protection which meant the men were exposed in all weather conditions, and there was nowhere to sit in the gondola which meant long periods of having to stand up. In the early part of the war the bombs had to be dropped by hand! 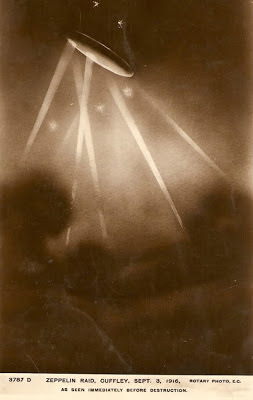 Most Zeppelins flew too high for British aircraft to catch and attack them but by the autumn of 1916 British airplanes were equipped with explosive shells (and later, incendiary bullets) and on 2 September the first Zeppelin was shot down by a British pilot. After two more unsuccessful raids, the Zeppelins stopped coming. By 1917 most German airships were restricted to reconnaissance work at sea. According to the Illustrated History of the First World War by John Keegan, "Germany flew a total of 115 military Zeppelins during the war, of which 77 were destroyed, 7 captured, 22 scrapped and 9 surrendered to the Allies". My great-grandparents may not have been directly affected by the Zeppelin raids of 1915-17 but they were certainly witness to its overall destruction and reign of terror across England. I know that my great-grandparents would have seen continual wreckage through both the Zeppelin raids and the Gotha Raids in London. During the early part of the First World War my great-grandmother Elizabeth was living in Fulham, raising four children alone whilst her husband, my great-grandfather Albert, was fighting off the coast of Turkey with the Royal Navy Reserve. It is known that areas nearby to Fulham were repeatedly targeted and bombed in the 1917 Gotha Raids. I believe that is why Elizabeth and my great-aunts and great-uncles subsequently moved to Edmonton around 1917-18. My paternal great-grandparents were living close to the coastline of Suffolk during the First World War. My great-grandfather Arthur Ward may have been on the Western Front serving his King and Country but his wife, my great-grandmother Barbara, was living in the heart of London with four of their children, including my grandfather Herbert. It is no small wonder that following 1917, they moved back to Suffolk. Great to learn more about the Zeppelin raids as it ties in so well with my contribution on the Christian name Zeppelina at http://scotsue-familyhistoryfun.blogspot.co.uk/2012/11/z-is-for-zeppelina-zetland-zeal-and-zest.html. Thank you for all your fascinating entries in the challenge. 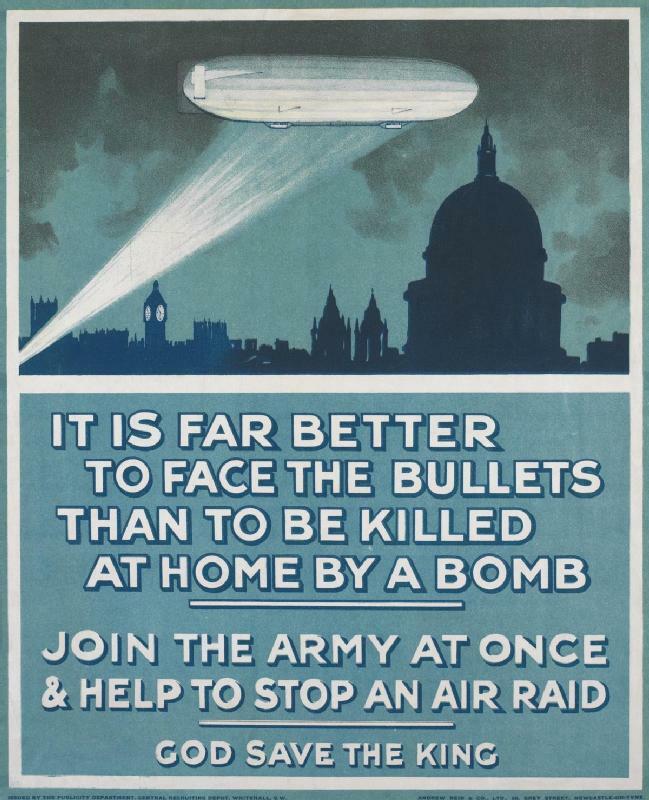 I never knew about the zepplin raids. It must have been very frightening. That poster may have been good for recruiting but pretty bad when you think they would be leaving their families behind to face those same bombs. 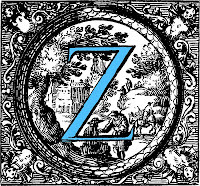 Great Z post! I'm have to agree with Kristin, I hadn't heard of the Zepplin Raids before, so thankyou for such an enlightening post.